John Smith, a sixteen year old boy, spends his life on the move with his guard, Henri. John’s life was turned upside down at a young age when the Mogadorians, an alien race, attacked the planet he lived on, Lorien, and the inhabitants were forced to evacuate. Only eighteen people were known to have successfully left the planet and reached Earth, their last resort for safety. The survivors included John Smith, Henri, eight other children, and eight other guards. Before leaving the planet, the nine children were numerically enchanted with a Loric Charm. This protects them from being hurt by the Mogadorians out of order, serving as a barrier from them all being wiped out at once. When a sibling in the numeric order is found and killed, a circular scar wraps around the right ankle of those still alive as a warning for the remaining Loriens. John has three circles around his ankle as the Mogadorians got to Number One in Malaysia, Number Two in England, and Number Three in Kenya and killed them in succession. Whenever John receives a new scar, he is forced to relocate and erase ties to the past. Following the appearance of the third scar, Henri and John decide to move to a small, old-fashioned, quiet town in Ohio because John is Number Four. He is next. The secrecy of John's new location will be the key to his survival. If the Mogadorians discover his location, all might be over for sixteen year old John. In the town he now calls home, John encounters first love, powerful new abilities, and many unexpected friends and foes. 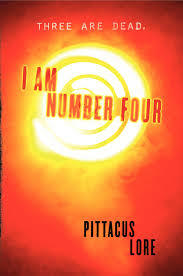 Prior to reading the book I Am Number Four by Pittacus Lore, I had really low expectations for the book. I disliked the idea of reading about aliens, but I decided to step out of my comfort zone and try a new genre. Although the story started off slow with descriptions of the aliens and planet, as the story progressed I could not put the book down. The story shows a great amount of emotion, and demonstrates the dilemma that each person faces dealing with a new environment and fitting in. The only flaws with this book are the extensive lists of detail it has on the planet Lorien. Although it helps create a more vivid image of the setting, I felt it was boring and unnecessary and did not further build up the climax. I would recommend this book to middle and high schoolers as some parts may be difficult to comprehend for younger audiences. Overall I would rate this book eight out of ten stars. 1. What happens when one of the siblings that have had the Loric Charm cast on them is found and killed? 1a. A circular scar wraps around the right ankle of those still alive. 2. What planet do the “Garde” come from? They come from the planet Lorien. 3. When the third sibling was killed, where did the main character move to? What is the main characters current fake name there? He moved to a small city in Ohio with his guard, Henri. He changed his name to John Smith. 4. Who bullies John as soon as he arrives at the new school? Why? 4a. Mark, a senior, bullies John. He is jealous because Sarah, his ex-girlfriend, likes John so he resorts to bullying him as a way to get back. 5. How did John open the Loric Chest? 5a. After John’s first legacy appeared, John and Henri pressed their palms against the lock on opposite sides of the chest. They interlocked fingers which lead to the opening of the chest. 6.Who drove to Athens and why? Sam, John’s new best friend, drove to Athens to look for Henri because it was late and John was worried about where Henri was. Sam also stated that if his dad was in trouble that he would take the car and go in second to save his dad. So Sam did the same for John. 7.How does John convince Henri to stay in Ohio? John uses his telekinesis and lifts him in the air until Henri agrees to stay in Paradise, Ohio, against his own will. 8.Why does Henri want Sam’s magazine? In the magazine there are issues on Mogadorians that worries Henri. He wants the magazine to find out more information about the Mogadorians and about where they are and what they are planning to do with John. 9. What happens after John saves Sarah on the hayride? 9a. She gives him his first kiss. 10. What happens when Lorics and humans try to have children? Examples. It results in exceptional and gifted humans. Examples include: Buddha, Aristotle, Julius Caesar, Alexander the Great, Isaac Newton, Albert Einstein, Aphrodite, Apollo, Hermes, and Zeus. 11. What does John do when Sarah gets trapped inside of the burning house? 11a. John uses his Lumen power (toleration of heat) and walks straight into the burning building. He saves Sarah and Mark’s two dogs. 12. Why can’t John sleep the night of the fire incident? 12a. He is scared that he will be in the paper the following morning as a hero for saving Sarah. He is scared because then Henri will know the truth, and people will get suspicious about how he survived the fire. 13. Who comes and tries to help John defeat the Mogadorians? 13a. Number Six comes because she had been searching for John ever since Number Three was killed. She came to help John defeat the Mogadorians. 14. What is Bernie Kosar? 14a. Bernie Kosar was originally only John’s dog, but John comes to realize that he is a Chimaera. A Chimaera is an animal that can change into many other animals. Bernie was the gecko John had in Florida and on the runs to school, Bernie would go into the woods, change himself into a bird, and catch up to John. 15. How does Henri die? 15a. During the battle, the beast throws a hard sweeping blow at Henri and fatally injures him. He dies within a few hours of receiving the wound.